Essentially, the 1982 Gringoire function the same of he does in the 1939 movie as the lovestruck poet who falls in love with Esmeralda and is desperate to save her. However the 1982 Gringoire employs different means than his 1939 counterpart to save her. 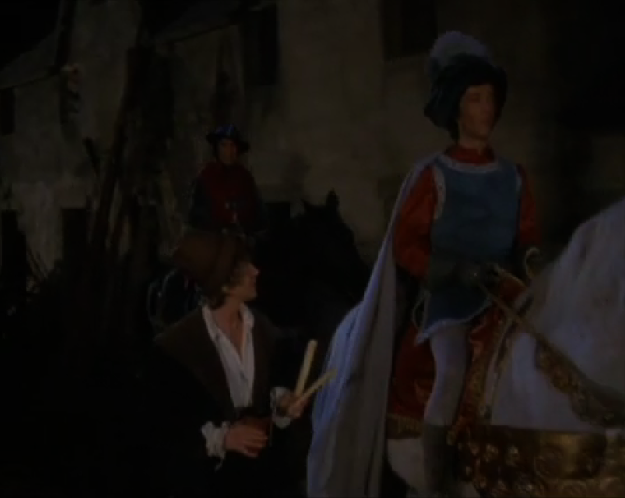 The 1982 Gringoire doesn’t use words and the printing press to save Esmeralda. Instead he uses a speech. 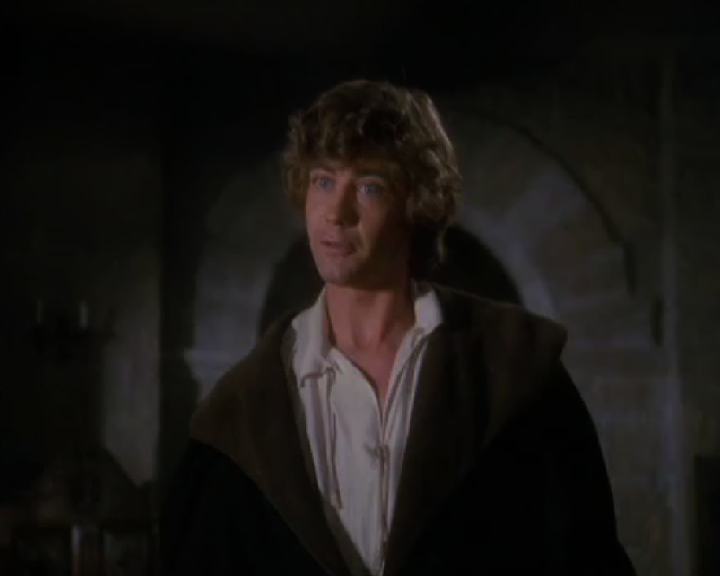 He also suggests to Frollo that he could switch places with Esmeralda and that he will be willing to die in her place. This was in the book except it was Frollo that suggested the idea and Gringoire rejected it. The 1982 Gringoire has some new facets to the characters. First we see Gringoire trying to sell some sonnets. I think this is the first and only time we see him doing this. he also is the only Gringoire to write a poem for Esmeralda. 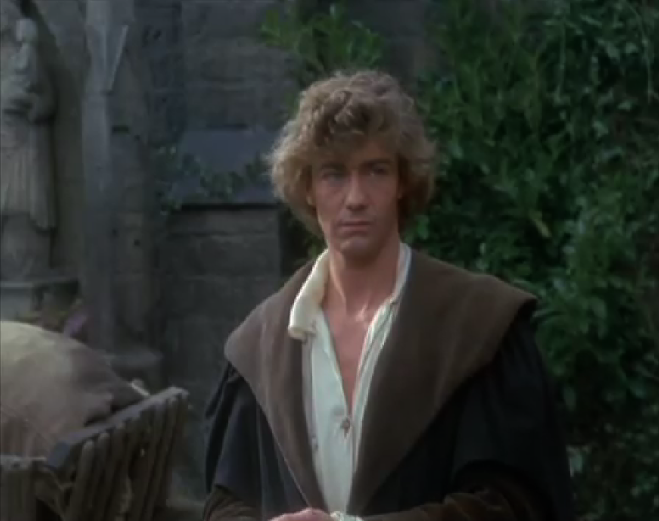 He is also the first and only Gringoire to get very jealous at Esmeralda’s adoration for Phoebus. Aside from these instances of character the 82 Gringoire is very much like 1939 version. 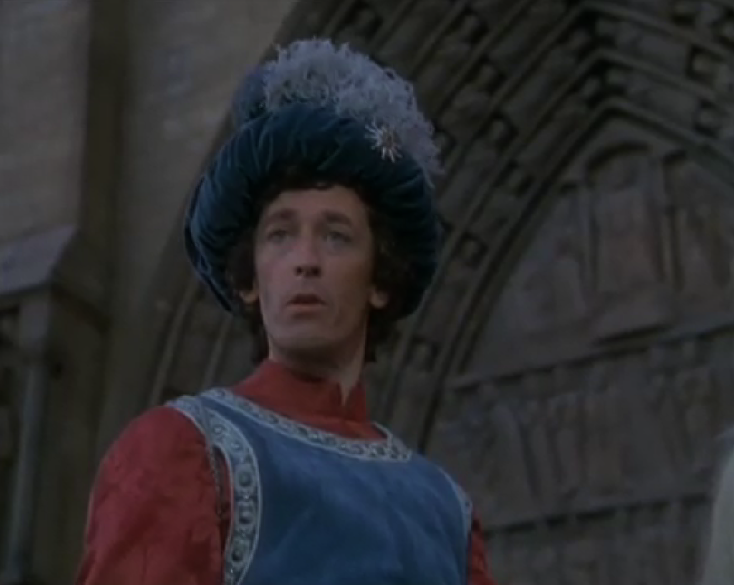 However, the 1982 version of Gringoire feels more like a real person. The 1939 version was a bit too nice and perfect. He doesn’t seem as in control the same way as the1939 version. This one gets jealous and petty in regards to Phoebus and his utter desperation to save Esmeralda while really expecting nothing makes him compelling. 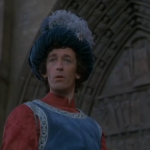 Is it the 1982 version of Gringoire greatest bestest Gringoire ever? No but it’s not an offensive depiction and it’s solid which consider most adaptation of the story is a very good thing (having flashbacks to Enchanted Tales version of Gringoire).